Mr. President, enough about the stock market! Posted by Jeff (ILoveCapitalism) at 12:21 pm - August 2, 2017. Aug 1 – Stock Market could hit all-time high (again) 22,000 today. Was 18,000 only 6 months ago on Election Day. Mainstream media seldom mentions! Jul 31 – Highest Stock Market EVER, best economic numbers in years, unemployment lowest in 17 years, wages raising, border secure, S.C.: No WH chaos! Candidate Trump understood that the stock market was a Fed-inflated bubble. Candidate Trump understood that the unemployment numbers are fake and disguise the ongoing suffering of Middle America. If President Trump is now tying his reputation to those numbers, what happens when they reverse? The stock market IS overvalued, and WILL go down eventually, if only for “cyclical” reasons. Maybe down a lot. What happens then? Consider that Switzerland’s central bank is now a huge holder of U.S. stocks First…Why? Why would they be in the business of propping up the U.S. stock market? Second…What happens when they change their minds, and sell? Posted by V the K at 2:06 pm - July 10, 2017. Illinois is losing people and businesses because of its highest-in-the-region tax burden. So, their solution is to raise taxes on the remaining people and businesses to offset the lost revenue. Posted by Jeff (ILoveCapitalism) at 4:31 am - July 9, 2017. Trump hasn’t changed anything – yet; he has allowed Congress to pass continuing resolutions that change nothing. Having said that: his proposals are revolutionary. JULY 07, 2017 – The Trump administration aims to further tighten its grip on spending, issuing a memo Friday that calls for eliminating some federal agencies and cutting government jobs as part of the upcoming fiscal 2019 budget. FY2019 begins a little over a year from now, in October 2018. That’s a ways off. Trump’s proposals don’t touch Social Security or Medicare, the most fiscally-dangerous entitlements. And Congress will mangle any cuts that he does propose. So, all this is slow progress. Having said that: It is very different from what Obama or Hillary would have proposed. While the President does not set the budget, he runs OMB and gives important input. Trump has suggested that food stamp recipients should have to work. And here are 66 programs that Trump would want to eliminate. All this surely adds to the intensity of left-wing and Deep State opposition to Trump. As the saying goes, “Follow the money”. Re: Deep State, consider that Trump has proposed deep cuts to the State Department and foreign aid. And I’ve heard tales (sorry, I can’t find the link right now) of CIA employees adoring Obama because of the way he boosted their budgets and salaries; if true, of course they would perceive the “unknown”, budget-cutting Trump as an enemy. Again, the President does not dictate the budget – constitutionally, the Congress does – but the tendency/direction of his proposals has an impact. That we have a President who will propose cuts, is a Regime Change. Let’s hope it sticks. Posted by Jeff (ILoveCapitalism) at 12:33 pm - July 7, 2017. A week ago, Zero Hedge reported on a study that Seattle’s minimum wage law is costing workers their income and jobs. But St. Louis workers face better times. The Missouri legislature passed a pre-emption law to invalidate that city’s hike. Fearing the political backlash…Missouri Gov. Eric Greitens wouldn’t affix his signature to the bill; Missouri’s constitution stipulates that bills that go unsigned by the governor automatically become law. What happens in general, when wages go up too far, too fast? China has the answer. Manufacturers, squeezed by rising labor costs and a paucity of skilled workers, are fueling an unprecedented boom in the adoption of automated technologies to cut down on the number of workers needed on factory floors, according to the latest findings of the China Employer-Employee Survey. Remember that video of China’s parcel-sorting robots? Or, closer to home, we could talk about McDonald’s replacing its cashiers with kiosks. Will Trump Raise Taxes on the Wealthy? Posted by V the K at 3:46 pm - July 3, 2017. It’s an idea the Trump White House is floating. I’m actually not too much opposed to this, depending on how it would be implemented. Under Obama, Bush, and Clinton, the amount of wealth in the upper income ranges grew dramatically while middle-class and working class incomes stagnated (and in many cases declined). 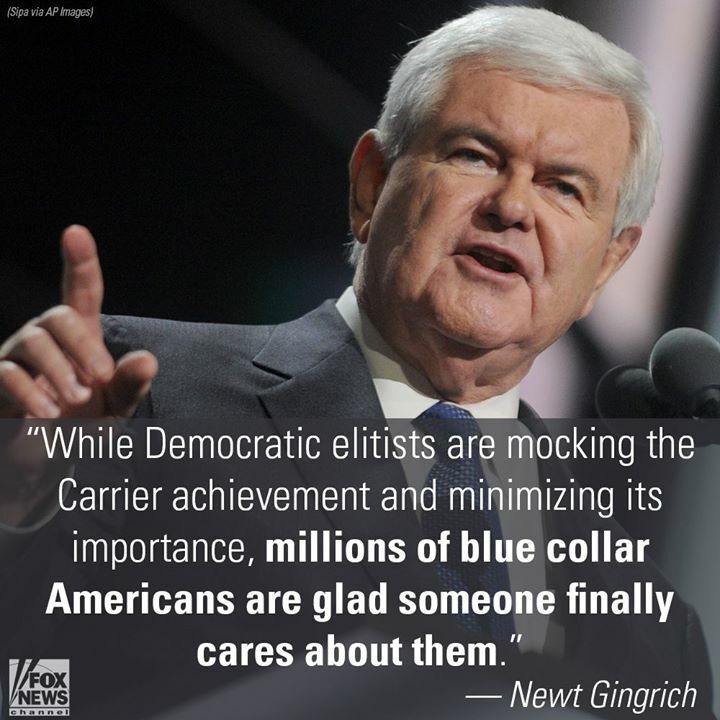 Most of those affluent people vote for Democrats, so maybe they should get what’s coming to them. Good and hard. There are a lot of ways to accomplish this ends through tax reform without dramatically raising rates on the uppermost levels of income. For example, the elimination of the deduction for state and local taxes would primarily hit upper income levels in blue states like New York and California. There are all kinds of other carve outs in the tax code that could be also eliminated. Were it up to me, I’d deep-six all deductions except for mortgage interest on your primary residence, and charitable contributions. Of course, were it up to me, there’d be just a flat income tax and a consumption tax. No one listens to Zathros. Under our current system, taxes are paid primarily by people who aren’t poor enough to avoid them and aren’t rich enough to evade them. This, above all else, is what needs fixing. Posted by Jeff (ILoveCapitalism) at 3:29 pm - June 28, 2017. After famously lying to the American people about what happened in Benghazi, and spying on Obama’s domestic opponents, Susan Rice now suggests (while pretending to be above suggesting it) that people criticize her just because they’re racists and sexists. Even CNN left-wing kook, Van Jones, will tell you privately that Trumprussia is a “nothingburger”. A new study shows that Seattle’s $15 minimum wage is costing jobs. Yet lefties still support these job-destroying, business-destroying, income-destroying laws. The Federal Reserve’s chair, Janet Yellen, says that we won’t see another financial crisis in our lifetimes. On a fun note…Milo had a Coming Out Conservative event in New York. I’m sure GP readers can relate to idea that nowadays, it is MUCH harder to come out as conservative than as gay. Why Isn’t the Blue Model Working? Posted by V the K at 11:11 am - June 28, 2017. Illinois is about to enact a massive tax increase. The Republican governor wanted property tax reform coupled with pension reform to tame the state’s out-of-control debt. But the Democrats who control the legislature only know one tool — tax increases — and it was the only one they were willing to use. Even this massive increase in taxes will only put a small dent in the state’s debts; and that’s if the Democrats don’t use it for more spending, which they will. It’s so bad in Illinois that Megamillions and Powerball are going to suspend lottery ticket sales. The Blue State of Connecticut enacted major tax increases in 2009 and 2011 and has become even more financially insolvent as state spending outpaced receipts. People… especially, people with healthy incomes… are fleeing Illinois and Connecticut. Meanwhile, the states of Florida and Texas, which have no income tax, are not only attracting new residents and new business, but are also fiscally solvent. How can that be if the Democrat formula of high taxes and lavish Government spending is the optimal formula for success? Democrats claim that people want high taxes to pay for the pensions and fine work of Government bureaucrats. Democrats claim that “investments” (spending) on their pet projects pays off with higher wage earners contributing to a robust economy. But it seems like, given a choice, people prefer to live where taxes and levels of “public services” are lower. Posted by Jeff (ILoveCapitalism) at 4:30 am - June 24, 2017. Real GDP grew 10% from 1930-1939. Real GDP grew 14% from 2007-2016. Still not much difference! The point remains that the last 10 years have been super lame. President Obama was perhaps the first in U.S. history to never have a single year of real GDP growth over 3%. And it’s possible that Obama’s record was yet worse. Remember, in recent years they’ve been padding the GDP numbers. They directly added nonsense to GDP. They also under-estimate inflation, which artificially boosts the growth estimates. But for now, let’s stick with official numbers (where Obama’s overall record is nearly as bad as a Great Depression), and pivot to look at unemployment. They let him jack the national debt from $10 trillion to $20 trillion. Even a monkey could make GDP seem halfway-OK for 8 years, if you gave him a $10 trillion credit card. And they baked the unemployment statistics. Remember, the official 5% number hides a huge decline in Labor Force Participation, plus full-time jobs being replaced with crappy part-time jobs. If you add back the people who left the labor force in despair these last ten years, real unemployment is 11-12%. And if you add the extra part-timers (assuming they would rather be full-time), it’s even worse. Depression 2.0 has been with us, all this time. It’s part of why people were so unhappy with Queen Cersei in 2016 (who ran as the Establishment’s poster child). What does all this bode for President Trump? Probably not well. He’s trimmed back some of Obama’s growth-killing regulations. That will help. And his infrastructure spending may go to productive works (unlike Obama’s 2009 “Porkulus” package), if he can get it passed. He wants to revive American manufacturing, which would be good. BUT, with so much debt on the books and so many Americans expecting handouts, our underlying economic problems are worse than ever. Trump has inherited a sinking ship. The next recession should be a roller-coaster. If the American Left is krazy and violent now, just you wait. Then again, maybe our leadership will hit on the solution quickly (a Free Enterprise system with smaller government, Rule of Law, sound money, cutting the Welfare-Warfare State, letting Washington and Wall Street fail, letting Main Street pick up the pieces). And maybe our leadership will use the media skillfully (plus a few well-placed arrests) to transition people’s minds to all that. Don’t tell me I’m dreaming. OK, I’m dreaming. Time to buy more ammo. Posted by Jeff (ILoveCapitalism) at 8:55 pm - June 4, 2017. Donald J. Trump Retweeted Eric Trump – Eric Trump Retweeted Reuters Business – JUST IN: Dow, S&P 500 and Nasdaq set record closing highs. I wish he wouldn’t. Let’s be clear. Stock market numbers matter to individuals; not the nation. Low numbers don’t mean a President is doing a bad job, and high numbers don’t mean he’s doing a good job. The stock and bond markets are bubbles, fueled by the Federal Reserve Bank. As I said under President Obama, way back at Dow 14,000. We also have bubbles in the real estate, auto loan, student loan, forex (USD) and cryptocurrency markets. But I digress. Now Trump is taking credit for the high (bubble) numbers. Big mistake. Instead, he should be warning Americans about how poor the economy’s fundamentals still are (thanks to Obama – until a lot more of Trump’s reforms get enacted). And readying us for hard times in the next recession. “Live by the sword, die by the sword.” If Trump is going to take credit for high stock markets now, people will slam him when they fall. He will propose spending cuts? Posted by Jeff (ILoveCapitalism) at 12:19 pm - May 22, 2017. The true level of taxation is the government’s spending level. All spending must be paid for, one way or another. There are 3 possibilities. 2. Borrowing. This is a covert tax, a tax on the future (when either the debt must be repudiated, or more and more government revenues must be diverted to servicing it). 3. Money-printing. Another hidden tax, this time on the real value (the purchasing power) of everyone’s wages and savings. Also known as “inflation”. So really, it isn’t a tax cut unless it’s a spending cut also. Trump wants to cut the overt taxes. So, what? Without spending cuts, it’s only a corresponding increase in the hidden taxes: borrowing and/or money-printing. I gotta give credit where it’s due. It looks like Trump is going to propose spending cuts? Whether the Republicans in Congress will tolerate any cuts, is another matter. the government IS large. Spending and promises (entitlements) skyrocketed under Bush 43 and Obama. But the Controlled Media is sure to make them sound like the Entropic Heat Death of the Universe. Posted by Jeff (ILoveCapitalism) at 8:53 am - May 17, 2017. It wrecks the Price Mechanism. Even if you had truly altruistic people in charge, such an economy still can’t function. Only bad-or-stupid people want a wrecked price mechanism. Thus, only bad-or-stupid people advocate socialism. And the bad people know how to shepherd the stupid people; thus, the bad people always end up in charge. All goods and services must be rationed, by one means or another. Markets ration things by having people pay a market price for the available supply. If something is in short supply, those who have the highest “score” in terms of being both able and willing to pay, will get it. “Willing” as in, free will / the person’s choice. The market price moves up and down, accomplishing two big things as it does so. The coordination is spontaneous and responsive to changing conditions, because it is voluntary. If you interfere with the price mechanism, you interfere with (or even block) that coordination. OK, so the price mechanism is objectively great. It induces voluntary coordination among vast numbers of people – thus enabling the Division of Labor. Who would want to mess with that? The answer is: People who gain by interactions that are not voluntary. People such as moochers, thieves, thugs, politicians and bureaucrats. People who lack the ability or willingness to produce. People who hope to live by altering or preventing market outcomes. People who think they can plan and control others better than those others can. People who are willing to gain by keeping others down. In short: People who gain by dictatorship. Arrogant people who enjoy using force on others to prevent the peaceful activities and outcomes that people would otherwise create on their own. That’s the nature of socialism. It’s not a noble ideal. It’s a curse, an evil. Like the Mafia, it’s always led by bad people because it *is* bad, in its nature. It can never be desired by people who are both good-hearted and knowledgeable. Therefore, it can never be led by them. And, even if it were somehow, it still wouldn’t function – because of the wrecked price mechanism. This feeds into how the term “socialism” is defined. An old, strict definition is: public ownership of the means of production. But people today use the word with a much broader meaning: Any system where a governing authority intervenes in markets, preventing the market price mechanism from operating. The socialist planners always proclaim their good intentions. And they always make things worse. And it’s not an accident or a failure to apply socialism; it’s inherent in socialism. Wrecking the price mechanism kills spontaneous, voluntary coordination; and that’s the point of the thing. It’s why stupid-or-bad people love socialism. They WANT to control others and prevent market outcomes. It’s not a proverbial “unforeseen consequence”; it’s the point. Posted by Jeff (ILoveCapitalism) at 2:19 pm - April 27, 2017. Eliminating almost all income tax deductions, except mortgage interest and charitable contributions. (No more deduction for your State or property taxes, among other things.) Increase in the “standard deduction”. A “territorial system” where future profits that corporations earn abroad, are not taxed. Repealing a bunch of taxes and complications, most notably the Alternative Minimum Tax (AMT) and the estate tax. Of course, Congress still has to chew on it. Taking Trump’s proposals by themselves, I have little objection. Rates should be lower. High income taxes are a form of slavery. Corporate income taxes are stupid because they are an indirect, distorted sales tax (that is, a tax paid ultimately by consumers). Estate taxes destroy many small businesses (forcing families to liquidate the business in order to pay the 50% tax or whatever). Nonetheless, I can’t praise this plan. Because it will reduce revenues at first, without being matched by spending cuts. Our budget will come no closer to balance. President Obama already doubled the U.S. national debt in his 8 years, from roughly $10 trillion to roughly $20 trillion, for an average real annual deficit around $1.25 trillion. Is Trump going to beat Obama’s record? I sure hope not. This is an important point. The true level of taxation is the government’s spending level. All spending must be paid for, one way or another. There are 3 possibilities. Borrowing. This is a covert tax, a tax on the future (when either the debt must be repudiated, or more and more government revenues must be diverted to servicing it). Money-printing. Another hidden tax, this time on the real value (the purchasing power) of everyone’s wages and savings. Also known as “inflation”. And what happens when we add (say) a Trump infrastructure spending package and a Syria or North Korea war on top of that? More of the hidden taxes: borrowing and/or money-printing. Posted by Jeff (ILoveCapitalism) at 5:02 am - April 19, 2017. On certain issues, leftist harping is especially odious. One is the minimum wage. with that San Francisco bookstore that was destroyed by a minimum wage increase it had supported. Leftists like to deny math and other facts of business and economics. What makes it odious is, they’re also smug about it. It isn’t just their ignorance; it’s their aggressive pride in staying ignorant. Via HotAir, now a study confirms that San Francisco’s minimum wage does indeed injure the businesses and workers of that city. San Francisco’s higher minimum wage is causing an increasing number of restaurants to go out of business even before it is fully phased in, a new study by the Harvard Business School found. The closings were concentrated among struggling, lower-rated restaurants. The higher minimum also caused fewer new restaurants to open, it found. “We provide suggestive evidence that higher minimum wage increases overall exit rates among restaurants, where a $1 increase in the minimum wage leads to approximately a 4 to 10 percent increase in the likelihood of exit,” report Dara Lee and Michael Luca, authors of “Survival of the Fittest: The Impact of the Minimum Wage on Firm Exit.” The study used as a case study San Francisco, which has an estimated 6,000 restaurants in the Bay Area and is ratcheting up its minimum wage. So, Nancy Pelosi and her fellow limousine-socialists are looking at fewer restaurant selections for themselves – and more unemployed people. Do they understand that? Or even notice it? There is only one time when the minimum wage doesn’t hurt employment: When it’s low enough, in real terms, to be ineffectual. For example, if we have a period of inflation – and no minimum wage increases – then its real value will go down, and employers can afford to hire the low-end workers again. But the higher the minimum wage is, in real terms: the more low-end workers can’t get work. Posted by V the K at 7:13 pm - February 26, 2017. The Democrat-Run city of Philadelphia passed a massive tax on beverages last year, to the cheers and applause of the Democrat Media Complex and left-wingers everywhere. However, increasing the cost of these beverages by 100% has had economic consequences. This is what they wanted, right? To get people … in particular, poor people… to stop drinking beverages they didn’t approve of. But now, the same people who passed the tax are getting all nasty about the effects of their tax. So, these Democrat geniuses passed a massive tax increase with the intention that by making soda less expensive, people would consume less of it. Now, they are feigning outrage that the tax is actually making soda more expensive and people are consuming less of it. But businesses, I guess, are supposed to just eat their losses and not realign their workforces in response? This is like the people who gleefully passed minimum wage hikes and are wondering why all the restaurants are closing. Posted by V the K at 10:01 am - January 7, 2017. One is almost tempted to believe that economists prior to BREXIT were trying to hype gloomy scenarios in order to encourage the outcome demanded by those with whom they were in political alignment. But that could never happen, right? Because economists are scientists, and scientists are never influenced by politics at all. Posted by V the K at 10:25 am - January 5, 2017. Macy’s yesterday announced it was closing a whole bunch of stores across the country. Sears is rumored to be on the edge of total collapse. Management at both companies is blaming the internet for their travails. I spent some time in Macy’s and Sears over the holiday shopping season. I don’t think their problem is competition with online retailers. I think a lot of it is their merchandise just isn’t appealing. (In addition to Christmas shopping, I’m renovating a 5,000 SF church, so I need all kinds of stuff.) Their retail model is dated, especially Sears which just seems to pile up stuff haphazardly throughout their stores. It’s just not fun shopping in a store where it looks like no one gives a crap. It probably didn’t help Macy’s that they dropped their Donald Trump line of menswear (because the management assumed since they hated Trump, everybody else did too), or that Sears outsourced production of Craftsman tools to China. I’m not an expert in “Retail Science,” but if I were in charge of either chain, my strategy would be to fall back and regroup. Forget about being a national retailer for a while and become a strong regional retailer. Hire local people as buyers and tailor inventory to regional tastes. I would also invest in the ‘shopping experience.’ One of the reason chains like Wegmans, Publix, and Nordstrom seem to weather the change is that they make coming into their stores a pleasing experience. I’m an outlier, but I don’t think the internet spells doom for all brick-and-mortar retailers. But the companies that run them need to recognize that shopping habits have changed. Shopping at a store in the mall is no longer a necessity, so you better give people a reason to come out and recognize that shopping patterns have changed. If I am shopping for bed linens, I want to be able to touch and feel them. I also want a pretty big selection to choose from. OTOH, if I am shopping for power tools, then I’m going to go online, read reviews, and go for the best value. There are also things I just want right away, and don’t want to wait for delivery of. e.g. If I’m painting a room, I’m going to buy brushes and tape locally. That kind of stuff. So, clean up your damn stores, have better merchandise, and teach your employees to be nice but not pushy, and you’ll get through this. Posted by V the K at 2:31 pm - December 10, 2016. 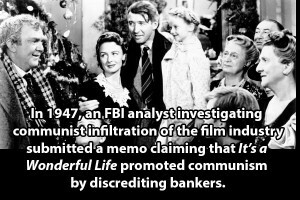 Tom Mullen at the Foundation for Economic Education has an interesting (and quite supportable) perspective on Frank Capra’s enduring holiday public domain classic: George Bailey was a huckster running a socialist Ponzi scheme and playing his customers for chumps. (Bailey Building and Loan being sort of the Bedford Falls version of OneUnited Bank). The real hero of ‘It’s a Wonderful Life’ was Old Man Potter. Without Potter, a large portion of Bedford Falls would be unemployed. When the Depression hits and the Bailey Building and Loan is exposed for the fractional reserve fraud it is, Potter offers to come to the rescue with a generous offer to buy out its customers. It is noteworthy there is a run on the Bailey Building and Loan and the local bank, but Potter is financially secure enough to save them both, proving once again he is the only honorable businessman in the film. Posted by V the K at 10:47 am - December 3, 2016. I’ve been reading a lot of discussion in comment threads about the Trump-Pence deal that saved 1,000 manufacturing jobs at the Carrier Air Conditioning manufacturing plant in Indiana. A lot of people are attacking the tax relief as “crony capitalism,” (even those who were perfectly fine with the billions Obama pumped into crony green energy companies like Solyndra) while others praise that it’s the first small step in Trump’s program to “Make America Great Again.” I side more toward the latter camp. Carrier is a small PR win that can be leveraged into a broader program of tax and regulatory form that will be good for the economy. I hope that’s what Trump is planning.